We’re going to refinish the the face of the headstock and the top/soundboard. So, the first step is to remove the old finish. Both top and headstock had, at some point, been finished with shellac. Shellac is a traditional finish for string instruments, but is fairly uncommon on steel-string acoustic guitars. The nice thing about shellac is that it can be hand-rubbed and touched up easily if needed. 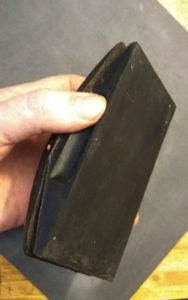 However, it isn’t very hard-wearing and the finish that had been applied here was thick and uneven. 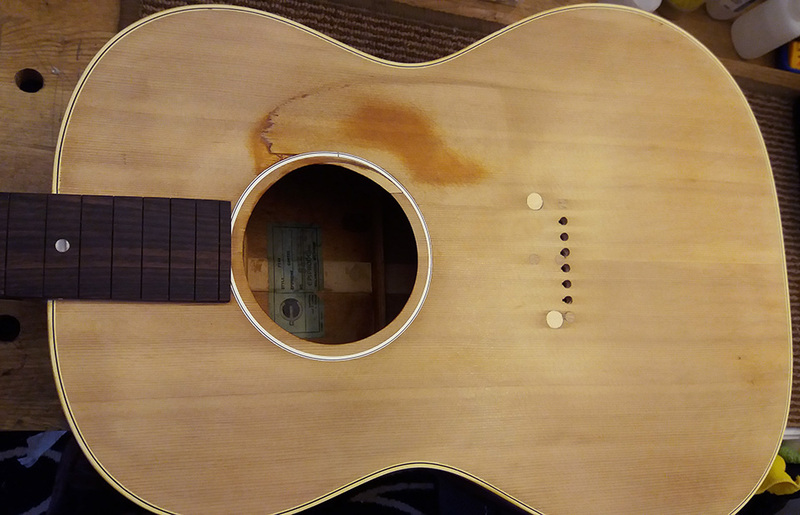 We’re going to refinish the guitar with authentic nitrocellulose lacquer which will give us a durable, thin coat that will, hopefully, bring out the best in the instrument. The is the scraper that did most of the work removing the shellac. 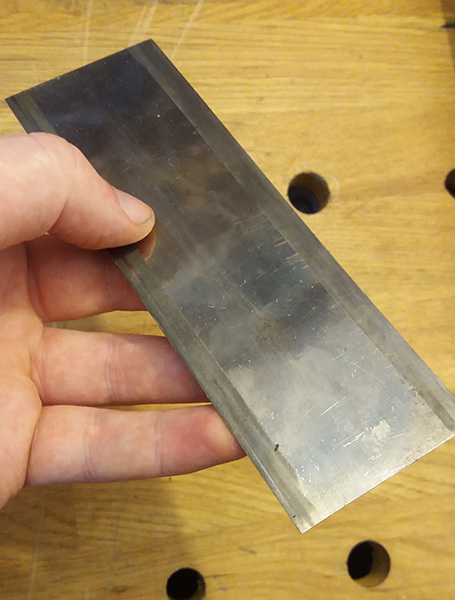 The key is to get it straight and keep a nice sharp, even burr along its edge. When scraping a large area you’ll probably find you need to hone and reburr the scraper a number of times. Keep a diamond stone handy! The other thing to focus on is bending the scraper so you can zone in on the area you’re working on. This curve will also prevent the corners of the scraper gouging big train tracks in your wood! The surface prep is finished with 320 grit paper and sanding blocks. I use two types: cork and rubber. The rubber block has a little more give and eases over uneven surfaces a little better than the cork block. You can see the repaired areas under the pickguard weren’t even touched by the scraper or sanding block. The wood in this area is already thin and it seemed prudent to leave well alone. I filled the largest void to the left with small slivers of spruce just to add a little strength and some finish pooling in there (I’ll try to dig out a photo for next time). This is it immediately after scraping. Mahogany has an open pore which needs to be filled if you want to get a flat finish (which we do). There are a number of good fillers on the market, but my choice for smaller areas like this is medium viscosity cyanoacrylate, AKA superglue. It is quick to work with, and leaves a perfect surface. Obviously, care needs to be taken! It probably deserves a special blog, so for now, I’ll talk about another glue I used on this project: hide glue.